The first time I visited the rain forest to hold a bush Gospel meeting, I remember being greeted by smiling brethren who, as I stepped out of my vehicle, promptly picked me up bodily while running to the forest and stripping off my pants. 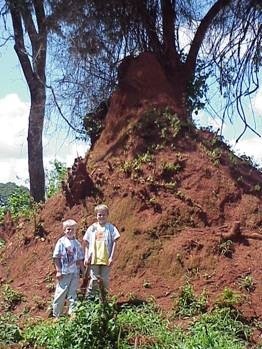 Though I had resigned myself to becoming missionary stew, I soon realized that I had stepped out into a column of mpazhi, red fire ants. While a bit hard on the dignity, the brethren’s method was most effective in removing these little beasts before they reached more painful heights. I can only hope that our neighbors might connect this challenge with my behavior the other evening as I was walking about our garden. Having stepped squarely into another column of mpazhi while looking at some flowers, I began to dance and strip before the Lord. “And David danced before the Lord with all his might; and David was girded with a linen ephod." Though short on linen ephods, I did have on Wal-Mart under linens… for which I was very thankful. 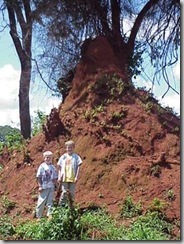 Pictured: Noah & Bryson in front of one of our smaller ant hills in our back garden.